ICTO conducted the yearly staff satisfaction survey to measure staff user’s satisfaction level regarding Help Desk services. Survey was conducted from 30 November to 31 December 2018. The yearly survey provides us a good reference to make further improvements. 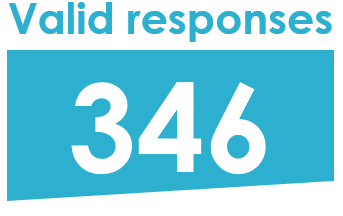 1867 email invitations were sent and 386 responses were received, with the response rate of 21%. 40 responses are invalid. 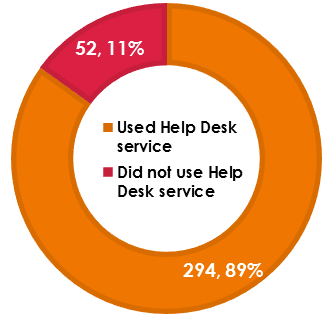 Among the 346 respondents, 294 replied that they had used ICTO Help Desk support service in the last 6 months. The rating from these 294 respondents is analysed. 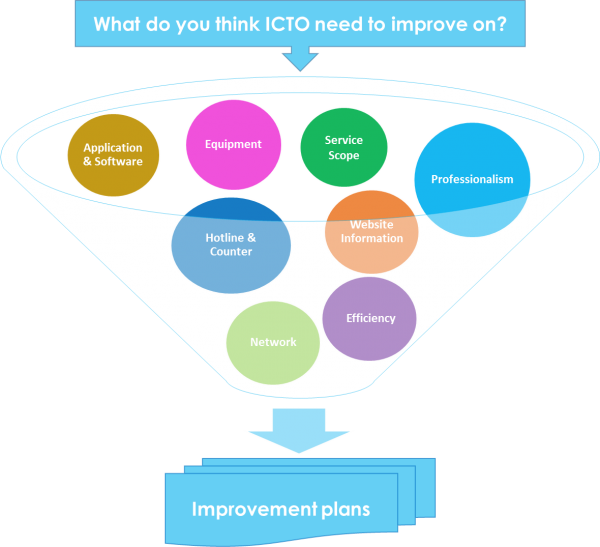 In order to receive respondent’s precise opinions, two open-ended questions were listed in the survey to collect feedback from respondents on the aspect of ICTO services that respondents appreciate the most and on what ICTO Help Desk can improve to serve the users better. 103 and 77 feedback were received respectively. 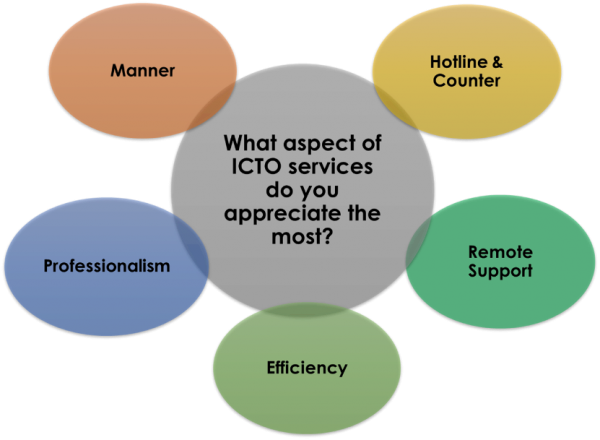 For the first question, the users appreciated ICTO’s efficiency, manner, professionalism, remote support service, hotline and counter service. For the second question, the aspects on which users want us to improve are shown below. There are some remarkable compliments extracted from users’ comments. User recognition is a great encouragement to us. We will continue to work hard to be the best.